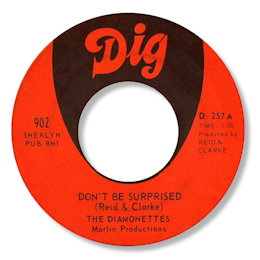 Miami girl group the Diamonettes sang backup to a lot of mid 60s sessions, especially those held by Johnny Pearsall, Willie Clarke and Clarence Reid, but only had a couple of 45s under their own name. “Rules Are Made To Be Broken” is a pleasant easy paced number, but Don’t Be Surprised is the track for me. This ballad has some very tasteful chord changes, and the vocals are as hard hitting as anyone could wish for. 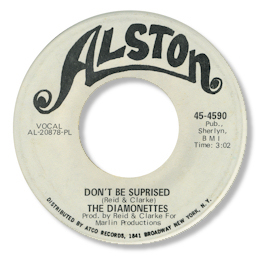 The Dig 45 was re-released on Alston but the tape that was used for the 45 was the one that the fine Miami voclaist Lynn Williams had recorded for Suncut - and that one was also wrongly used for the "Miami Soul Sisters" CD. 1. Miami expert Jeff Lemlich has posted an early Johnny Pearsall release on Green & Orange “Love of my dreams” / “Goodby my love” credited to the Diamondettes. Jeff makes a very convincing case here for this late 50s 45 being the same group as the Diamonettes - or some early variant of the group's personnel. I'm grateful for Jeff's help in sorting out the Diamonettes story here. 2. You can find both sides of Alston 4590 on the Henry Stone Music CD "Miami Soul Sisters". This is the Lynn Williams vocal rather than the original Diamonettes one though.